I've never had long hair and I've always wanted it. I have frizzy, curly hair that I need cut regularly and I'm also very impatient. 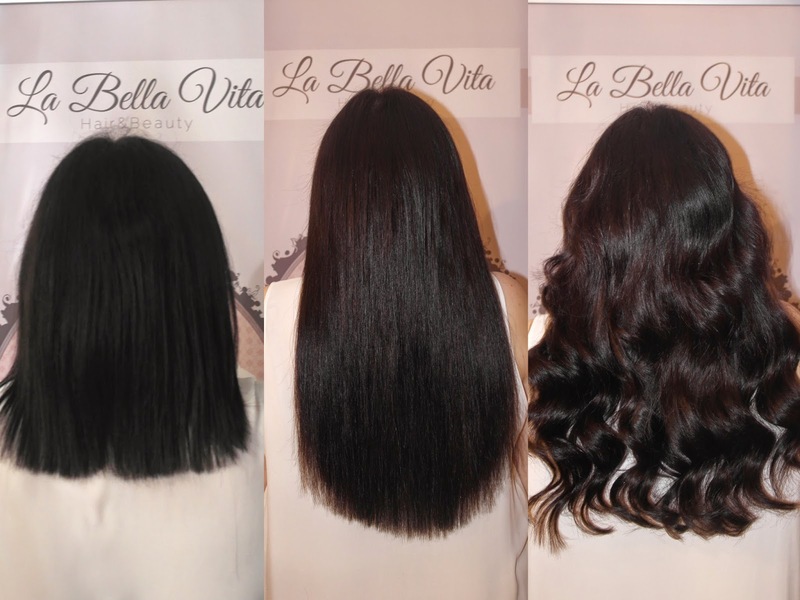 So when La Bella Vita Hair and Beauty contacted me to see if I would like hair extensions, I was over the moon. I know some people find extensions controversial but if you have good natural hair and are patient in looking after them, they can cause no damage. It is like anything you do to your hair- colouring, treatments etc. They all need maintained and looked after to achieve the optimum effects and the least damage possible. Many weeks ago on my Facebook, I had a very long debate about hair extensions in Belfast and where offers the best type. By far, La Bella Vita came up trumps with many of my readers saying they had used them and were impressed. La Bella Vita are based on the Upper Newtownards Road in Dundonald, close to the Ulster Hospital. They offer nano ring, micro ring, keratin bonded and clip in extensions. I wanted to have a permanent hair fixture so opted for micro ring extensions. These are strong, discreet and comfortable. At my consultation, I was told these would be best for me as my hair grows quickly and they can be maintained and moved up every 6-8 weeks, meaning I would get longer out of my hair extensions. All of the hair used is AAAA grade and double drawn, meaning it is the same thickness from root to tip. This was very important to me as I wanted to have super thick, Kim Kardashian hair. The hair is Indian Remy which is great as when it is dark, it has not been treated much meaning I will get much longer from my hair. I was so interested in the story behind La Bella Vita- two best friends Katie and Sarah started doing extensions initially on each other as they were huge fans of having luscious locks. They attended extension courses whilst studying at university (Film & Photography and Cardiology- clever girls) and got clued into all the latest techniques. They soon began doing their friends hair and the business grew out of Katie's home. La Bella Vita soon became a well know name in Northern Ireland for extensions and they opened their salon 8 months ago. Their salon also offers hair colouring and cutting (which is great as many hairdressers do not work with extensions) as well as many fantastic beauty treatments. The salon is absolutely gorgeous. It is so girly and comfortable; something that is very important when you need to spend significant time to get your extensions in. My extensions were applied by Katie who is one of the most lovely, fun people I've ever had to my hair. She really wanted my hair to be perfect and knew it would take a little bit longer as I have naturally thick hair. My hair required 250 bonds and this took just shy of 3 hours to apply. Micro-ring extensions are quick to apply and maintain as they connect the hair using a tiny ring which is then clamped shut. At my maintenance, the ring will be opened and pushed up. I only had the ends trimmed off the end of my 18 inch extensions (they also come in 20 inch if you really want to feel like a mermaid) as I wanted them to be as long as possible. Katie then curled my extensions with the GHDs. Curls hold really well in extensions meaning less damage to your hair in general. I can't wait to style my hair so many different ways over the coming months! Stay tuned over the next few months as I post about living with my hair extensions- I feel like a new woman! I will post a separate post about how I look after my extensions as I know it's one of the biggest questions that people will ask. For more information about La Bella Vita including treatments offered and prices, visit their website, Facebook or ring the salon on 028 90 480530.